1) goCAMPUSing shall be responsible as the principal party for making tour, travel, lodging, accommodations, events, activities, and the development of printed materials and tour aids which are part of a goCAMPUSing tour, however goCAMPUSing cannot be held responsible for the failure of a company or organization who goCAMPUSing has contracted to provide: ground transportation, air transportation, hotel lodging, food services or restaurant services, arrangements, accommodations, supplies, or arrangements to fulfill, execute, and/or perform as it had been contracted to do so by goCAMPUSing, except when there has been actual negligence on the part of goCAMPUSing. 2) goCAMPUSing cannot be held responsible for any events,(of any limitation), or conditions, (of any limitation) beyond its control. Such as, but not limited to: weather, accidents, vehicular breakdowns, traffic conditions, acts of God, strikes, governmental restrictions, delays, war, changes in college arrangements, the actions or omissions of any entity or person/persons outside the control of goCAMPUSing. These include, (of any limitation), events or conditions pertaining to, but not limited to: transportation, travel, accommodations, lodging, food, events, supplies, itinerary, and locations visited. goCAMPUSing and its staff, employees, and agents will be held harmless and free from any claims from such events or actions. Clients of goCAMPUSing can always obtain travel insurance, baggage protection insurance, trip insurance, or any other insurance at their own initiative and expense. 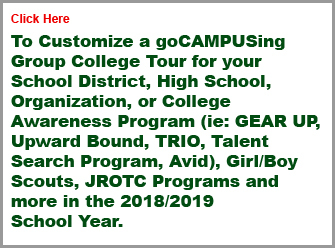 3) goCAMPUSing may be required to find it necessary, due to unforeseen conditions or events, to make revisions to itineraries of a College Campus Tour at any time, which may include cancellation or change of a college campus visit or presentation to one or more colleges. If those events do occur, clients agree to the judgment and decision making of goCAMPUSing and its staff. It is further understood that goCAMPUSing, its staff, employees, and agents shall be released from any and all claims arising from such actions of changes of itineraries and the possible cancellations of a college campus visit. 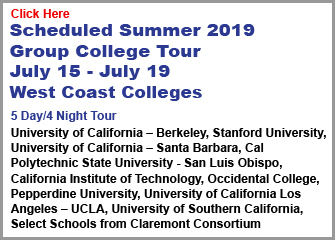 4) Clients and Students agree to abide by the college campus tour itinerary as established by goCAMPUSing, and agrees to adhere to and not depart from said itinerary, alone or with any other party or parties, unless agreed to by goCAMPUSing, a staffer, employee, or agent PRIOR TO DEPARTURE of said goCAMPUSing college campus tour – in writing and signed and agreed to by all parties. Unless otherwise stipulated it is agreed that Students and Parents/Legal Guardians agree to goCAMPUSing’s Terms & Conditions and to follow the travel and tour plans and participate in any activities and events goCAMPUSing has specified or arranges as part of a college campus tour; including parental and client permission to allow photographs/video to be taken to record and promote their goCAMPUSing college tour experience. 5) goCAMPUSing,its staff, employees, and agents will be held harmless and free from any liability of any claims relating to the Student’s or any individual’s well-being during the time, such Student or individual is traveling from home to the initial point of departure of a goCAMPUSing tour, returning back to home after debarking from a completed goCAMPUSing tour. goCAMPUSing will be held harmless and not liable from any claims as a result or event that happens prior to or after a goCAMPUSing college campus tour. 6) Students/Tour Participants hereby accept responsibility for their own conduct and judgment at all times during a goCAMPUSing college campus tour, regardless if the Student is participating in a goCAMPUSing organized or supervised or related event/activity. This responsibility includes, but is not limited to accepting any responsibility for any financial obligations that they may incur and for any damages or injuries they may cause. 7) ALL goCAMPUSing Students/Tour Participants agree to conduct themselves in a respectful and civil manner at all times during their goCAMPUSing tour, and will abstain from the use of any use of alcohol or illegal drug; as well as the use of any controlled substance/medication without a valid a prescription which goCAMPUSing has been notified in writing, in advance, and goCAMPUSing has agreed, is NOT in compliance with the Terms & Conditions of goCAMPUSing. In addition, Students/Tour Participants agree to comply with all goCAMPUSing tour rules and standards, whether given in writing or announced verbally. Failure to comply with these Terms and Conditions, including engaging in conduct that violates the standards announced by goCAMPUSing or is detrimental to the reputation of goCAMPUSing, or the tour; at the complete a total discretion of goCAMPUSing, a tour staffer, employee, or agent, to immediately TERMINATE a Student/Tour Participant from any further participation in a goCAMPUSing tour program and he/she/they WILL BE SENT HOME AT THEIR OWN EXPENCE, (or the expense of their Parent/Legal Guardian), and hereby agree to make no claims of liability and will not be entitled to any refund from goCAMPUSing or any staffer, employee, or agent. 8) No weapons, including but not limited to: guns, knives, (longer than a 2 inch pocket knife), any aerosol pepper sprays, or stunning electronic devices will NOT be permitted on any goCAMPUSing tour at any time. Possession of any such weapon is in direct violation of the Terms and Conditions herein and will result in immediate TERMINATION of a Student/Tour Participant’s further participation is a goCAMPUSing college campus tour, and he/she/they WILL BE SENT HOME AT THEIR OWN EXPENSE, (or the expense of their Parent/Legal Guardian), and hereby agree to make not claims of liability and will not be entitled to any refund from goCAMPUSing, or any staffer, employee, or agent. It is also important to understand that there may be legal requirements compelling goCAMPUSing to notify police, or other law enforcement, regarding an issue of a Student/Tour Participant in possession of a weapon. 9) It is understood and agreed to that Consent to Emergency Medical Treatment, as noted on the goCAMPUSing College Campus Tour Registration/Application Form covers any medical/health conditions that may affect a Students participation in a goCAMPUSing tour. It is the Parent/Legal Guardian responsibility to notify/inform goCAMPUSing of any existing medical conditions a Student has that may affect the tour and notify goCAMPUSing of any/all prescription medications that a Student might/will be taking while on a tour – ALL PRIOR to attending a goCAMPUSing tour. Failure to disclose said medical information prior to departure may preclude a Student from participating in a goCAMPUSing College Campus tour. The Parent/Legal Guardian also acknowledges that ALL of the information supplied in the goCAMPUSing Registration/Application Form is correct, true, and accurate, to the of their knowledge and will hold goCAMPUSing, their staff, employees, and agents, due to a lack of proper information or being supplied with false or misleading information. goCAMPUSing , as per the Registration/Application from pertaining to CONSENT for EMERGENCY MEDICAL/DENTAL TREATMENT, goCAMPUSing has is duly authorized to take/provide whatever action it deems necessary to preserve the health, well being, and safety of a Student/Tour Participant including but not limited to obtaining medical/dental treatment and/or securing emergency transportation back to Parents/Legal Guardians, (at the expense of said Parents/Legal Guardians). goCAMPUSing will make every reasonable effort to notify the Parent/Guardian or said Emergency Contact person, regarding a medical or dental emergency prior to obtaining treatment and will follow-up periodically regarding the medical/dental situation. It is also agreed that goCAMPUSing shall be promptly reimbursed for any and all expenses that goCAMPUSing may incur in their actions they performed in preserving or securing the health/safety/well-being of their Child, regardless of age of majority. 10) To cancel a Student’s goCAMPUSing College Campus Tour Registration/Application after a FEE is paid can be done only in writing, (a confirmed receipt email is acceptable). Regarding a refund, all REFUNDS at anytime will be minus an administrative processing fee of $75. plus any direct expenses incurred by goCAMPUSing, (like non-refundable airline tickets). A refund, minus the fore mentioned administrative processing fee and other expenses will be made ONLY if the cancellation is made 30 days prior to the scheduled tour day. 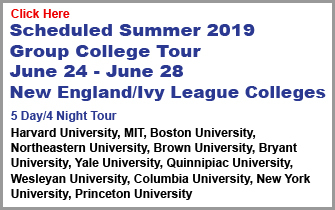 If a cancellation is made between 29 to 15 days prior to the scheduled goCAMPUSing College Campus Tour departure day – only 50% of the fee, minus the administrative fee and non –refundable expenses will be paid. Any cancellation made 14 days prior or less are not refundable. This Terms and Conditions regarding Refunds is understood and agreed to by the Student/Tour Participant and the Parent/Legal Guardian. 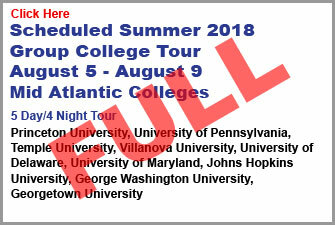 11) It is agreed to that the Student/Tour Participant and/or Parent/Legal Guardian is not entitled to any refunds on any, but not limited to: lodging, accommodations, food services, printed materials, which the Student /Tour Participant did not avail themselves to use or participate in, but was included in the goCAMPUSing College Campus tour program. It is also understood and agreed that missing a goCAMPUSing Tour’s departure time, initially or at any time during a college campus tour trip, at the result of a Student’s own fault, ie: tardiness, that the Student/Tour Participant will be required to secure their own transportation to either catch up to the goCAMPUSing tour, or return home at their own expense and additional costs. 12) It is understood and agreed, that Client Parties who are contracting the services of goCAMPUSing are granting goCAMPUSing permission to use their image and/or voice; as well as having secured, in writing, verbally or implied, the Parental/Legal Guardian rights and permission for goCAMPUSing, and their agents, to use the images of those Student/Tour Participants, (in still photography, video and sound – captured and/or recorded on a goCAMPUSing tour) for the purposes of goCAMPUSing’s Advertising, Marketing and Social Media endeavors, as well as for Public Relations and News purposes. Individual Tour Participants and the Parents/Legal Guardians of Minors who are Student Tour Participants may opt out by submitting a statement in writing to goCAMPUSing, received at least one day prior to the actual start of the particular goCAMPUSing College Tour that they/or their child will be participating; that they will not permit the use of their image or Child’s: image, likeness or voice for goCAMPUSing’s Advertising, Marketing, Social Media, Public Relations, and News purposes. 13) It is agreed that the adherence of these Terms and Conditions shall be effective and understood as an acceptance of said terms and conditions upon the goCAMPUSing Registration/Application Form SUBMISSION and Subsequent PAYMENT for a goCAMPUSing College Campus Tour. No other oral/verbal agreements or understandings will be valid. 14) This agreement is binding under the laws of the State of New York.